That's a far cry from saying that he "admits much in his book was made up." What it says is that the White House is filled with serial liars and that he had to navigate his way through those in order to come up with the truth and that the fact that so many of the staff habitually lies is in itself part of the story. Or people willing to cash in on the "anything bad about Trump sells" meme thats going on. I could start a blog with plausible confirmation biases based on "unnamed official sources inside the Trump White House" and have thousands of hits and ad revenue from those hits overnight. Completely made up but people want to read stuff that proves their bias right. Politicians and/or the folks working for them can be serial liars? Surely you jest. Or people willing to cash in on the "anything bad about Trump sells" meme thats going on. Or anything bad about Obama or Hillary. Or anyone else unfortunate enough to make it onto his enemies list. Completely made up but people want to read stuff that proves their bias right. Anyway, he's tweeting about his "Fake News awards" next week. "We should have a contest as to which of the Networks, plus CNN and not including Fox, is the most dishonest, corrupt and/or distorted in its political coverage of your favorite President (me). They are all bad. Winner to receive the FAKE NEWS TROPHY!" Wonder if the Fake News awards will include a book burning? "It is even less likely, at least at this stage, that Trump’s executive appointees, led by Pence, will depose him. The 25th amendment is only half a century old, and has never been invoked against the wishes of the incumbent president. Does anyone seriously believe that Trump, declared psychiatrically or neurologically incapacitated by his own cabinet, would shuffle meekly from office? Such a threat would trigger all his most brutal attributes: his belief that the establishment is against him and his proven ability to mobilise great swathes of the American electorate in a common hatred of Washington. Now, that really would be fire and fury." Wikileaks has uploaded the entire book if anyone is interested. I will use my physic medium powers and predict this week there will be articles across the net stating that Wikileaks making this book available for free confirms they are in cahoots with Trump. It will be stated that this is clear evidence that Wikileaks worked with Trump during the campaign and continues to carry their water. Further, I see articles saying that Mueller will investigate this. I have a strong physic vibe that the majority of these articles will appear in Newsweek. I'm not defending Wolff's book one way or the other. I was just correcting a misstatement about what he allegedly said. Some of us do care about accuracy. It's enough that the politicians are fast and loose with the truth. Like a joke Tweet about Gorilla channel. The Gateway Pundit is a hard-right website that is not afraid of conspiracy theories and the occasional flirtation with outright white supremacists. Not a credible source that occasionally publishes fake news. Liberal documentary filmmaker Michael Moore threatened to begin fracking off the Florida coast near President Trump's Mar-a-Lago resort. His tweet appeared to be a response to a new administration proposal to increase offshore drilling for natural gas. "Our fracking off the coast of Mar-a-Lago begins right after Labor Day," Moore said in a tweet referencing his upcoming TNT documentary series "Live From the Apocalypse." "I’ve already got the rig — a beautiful Halliburton G-0008 fracking system with a monster Caterpillar engine!" Moore, a relentless Trump critic and liberal activist, targeted the president's luxury Palm Beach resort, a favorite vacation spot for the president. Florida is on a list of states that could see new drilling off their coastlines under a new proposal by Interior Secretary Ryan Zinke. The plan would open up drilling rights sales for companies on much of North America's continental shelf in coastal areas near Alaska, California and Florida, which would be a boon to the fossil fuel industry. Moore's tweets also come after the Trump administration rolled back offshore drilling safety regulations that were created after the Deepwater Horizon spill in 2010 killed 11 people and sent at least 4.9 million barrels of oil spilling into the Gulf of Mexico. Environmentalists have warned that the expansion and deregulation of offshore drilling could be dangerous. Trump has promised to unlock the nation's "great energy wealth" by promoting domestic oil and gas drilling to remain independent of foreign energy. I'm not a massive fan of Michael Moore, but I chuckled at this possibility. Even more fun when the EPA charges Moores crew with the various infractions they will commit, because he will hire a bunch of non-drillers to run it. This is the transcribed interview of Glenn Simpson. Chairman Grassley and Ranking Member Feinstein requested this interview as part of the Senate Judiciary Committee's investigation of Fusion GPS's activities related to the dossier compiled by Christopher Steele, the Prevezon case, and the Magnitsky Act. It's long, 312 pages and although I'm only partway through it, but well worth the read. Betcha they won't do that for California's beaches (which already have rigs out there). Yup. 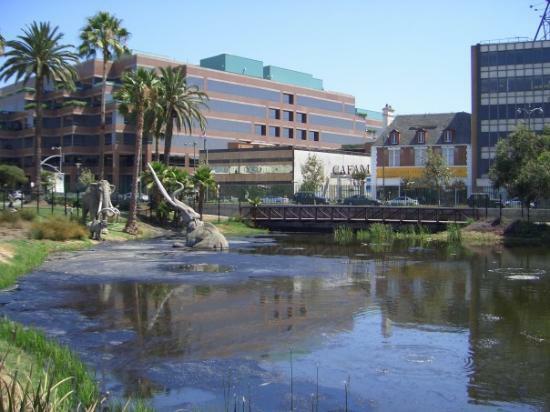 And then there's always the La Brea Tar pits. Stories surfacing about Twitter targeting right-wing user accounts and content while ignoring left-wing. YouTube likewise seems to be coming more and more biased. A grain of salt may be required - especially given Project Veritas' last big splash. 448 billion over 10 years. Didn't Obama do that in less than 1 year? Just asking. FY 2009 - Even though the budget had been approved, Congress added emergency funding to stop the Great Recession. It added the first year's worth of spending from Obama's Economic Stimulus Act to the FY 2009 budget. That $253 billion accrues to Obama. FY 2011 - This budget contributed $1.3 trillion to the debt. FY 2013 - This was the first Obama budget where the deficit, $679 billion, was less than $1 trillion. Thank sequestration, which forced a 10 percent cut in spending. FY 2014 - The deficit was $485 billion. FY 2015 - The deficit fell further, to $438 billion. FY 2017 - The deficit is projected to be $666 billion. Fair enough that could be the case but that video with first it's hand accounts right from employees didn't strike me as edited a specific way. Could be wrong of course. Do you think social media giants like facebook, twitter and youtube are biased to the left-wing side of things? Well, they all have one thing in common. HQ'd in Silicon Valley in California, and staffed by young educated millennials...in other words, not a hotbed of Republicanism, or even conservatism. So yes, I imagine they exist on the Left side of the spectrum, as well as the Left Coast. Moreover, they are all also businesses, and not public utilities, nor are they bound in any way by things like journalistic principals. They can do whatever they would like, within the bounds of fiduciary responsibilities to their shareholders. They have complete control over the content that is displayed on their platforms, and those platforms are moderated, much like this one is. Maintain data work requirements by following data program techniques, procedures as well as meeting and maintaining the required quality threshold. Note that he is, essentially, a moderator, as he was at Apple before Twitter, and is at Facebook now. According to Trump US delivers first F-52 fighter jets. So he misnamed the aircraft. CNN spends 93% of it's airtime slamming the President so they look for every error. Was the error really worthy on a new report by CNN? Better than our PM who states the F-35 "far from working", yet everyone else, except Canada, seems to be purchasing an aircraft that doesn't work. ...the stealth fighter jet is also touted as the most lethal and versatile aircraft of the modern era -- combining advanced stealth capabilities, radar-jamming abilities, supersonic speed, extreme agility and state-of-the-art sensor fusion technology. CNN spends 93% of it's airtime slamming the President so they look for every error. Is Fox and Friends his safe space? CNN's Don Lemon going off on the whole "******* countries" bit. Anderson Cooper, Wolf Blitzer, etc do the same but his is something else. It's as if CNN decided not to bother to play nice anymore.